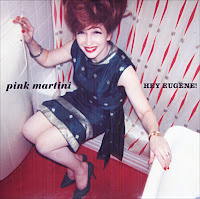 All Things Lovely: Pink Martini- What's in a name? No booze here! Just heady, intoxicating music. 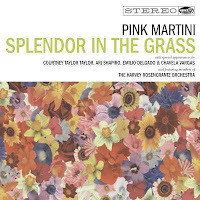 Pink Martini is high brow and pop culture all at once. This band has resurrected beautiful old songs, written beautiful new melodies and more often than not, just makes me wanna dance! 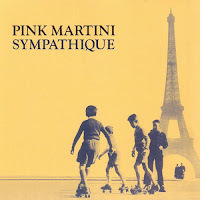 Which reminds me, the first Pink Martini song I ever heard is the islandy-sounding "Dansez- vous" (French for "Dance!) 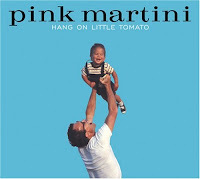 from their second album, Hang on Little Tomato. Pink Martini is a totally swingin' big band (literally BIG, with 12 members) hailing from Portland, OR. They cover 1940s, '50s and '60s lounge music- my absolute favorite genre- but what I love most is their global flair. While many of the songs conjure images of old Hollywood, smokey lounges and Breakfast at Tiffany's, others put you smack in the middle of a Cuban street festival or a French bistro or an Italian palazzo. They more or less dig up songs from all over the world, like "musical archaeologists," creating wildly diverse and eclectic compilations. The band members are as diverse as their music, including lead singer China Forbes (from Cambridge, MA) and bandleader, Thomas Lauderdale (from Indiana)- who come from multicutlural families and met while studying history and literature at Harvard. China Forbes has a huge voice, an alluring stage presence and an envious capacity for languages. She sings in English, French, Italian, Spanish, Russian, Croatian. In fact, they perform songs in 12 or 13 different languages, which is part of what captivated me from the start. The dazzling multi-lingual aspect brings a new (and refreshing) dimension to a period of music with which I am hugely fond of. Not surprisingly, Pink Martini spends a lot of time the world stage with a tour circuit that stretches from Hawaii to South Korea to Germany and, as I just learned, to Cleveland Ohio! And yes, we got tickets. I am so excited to see them play in a few weeks at Severence Hall, which, to my mind, is the perfect "music hall" venue for this band whom I so often compare with Lawrence Welk... minus the leisure suits. This is one of those bands whose music I can listen to over and over and over again, so thankfully, they have a new-ish album out called Splendor in the Grass. While downloading the album, one particular song caught my eye- Ohayoo Ohio- and it just happens to be my new favorite. Looking forward to hearing it performed live in Cleveland, Ohio. To be honest, I didn't know anything about Pink Martini, although I will find it as soon as possible 'cos I've had heard some positive opinions about it.